Sword tattoos are often a simple tattoo design that can make a very clear statement. The sword may also be added as an additional symbol to a tattoo that will add more dimension and meaning. An angel holding a lamb conveys a completely different meaning than an angel wielding a sword. The sword is often a military emblem; it has been the tool of warriors for generations of man. The sword can symbolize protection, liberty, honor, and benevolent power. All of these qualities are associated with heroism and valor. The bearer of a sword tattoo may wear it as a reminder to remain steadfast to personal ethics. It may also be worn to symbolize protection through difficult times. Sword tattoos can have religious significance as well. The sword was used to symbolize the word of God in the Middle Ages. A symbol for purification is a sword engulfed in flames, and when a sword tattoo also depicts a crucifix, this usually means the bearer is willing to fight for his faith. Swords may not be the centerpiece of a tattoo; they may merely be added to give a more complete expression of the design. Swords which appear with eagles may not only symbolize freedom, but a willingness to protect it. 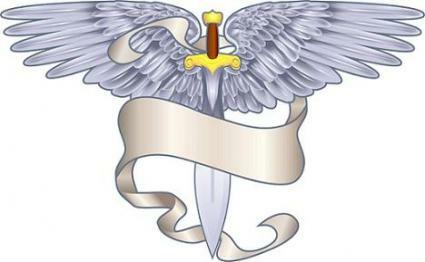 A sword lets people know that the angel in the tattoo is not merely a guardian angel, but a powerful archangel. A sword tattoo can have many different meanings. Swords have become a powerful symbol due to their pivotal roles in history and literature. The fact that many swords' names are better known than the names of the sword bearer reflects their historical importance. There is a certain magic associated with swords, and this magic translates into sword tattoos. There are many famous swords throughout history. Many swords went to battle on even after the passing of the warrior they belonged to. Zulfiqar- Sword of the prophet Muhammed, and later wielded by Husayn ibn Ali in the Battle of Karbala. Hanjo Masamune- Sword of a Japanese dictatorship established in 1603 called Tokugawa shogunate. Sword of Boabdil-This sword belonged to the last moorish King of Spain. Swords of mythology bear some of the most recognizable names. They were the power by which legends are made, and through the generations their stories have inspired many. Tyrfing-A cursed sword which brings death to the wielder and his family. A sword tattoo may be simple or ornate. Even though the sword lends itself to simplicity, be sure to find a skilled tattoo artist to work with. Take some time and look around for a unique design that really speaks to you. Swords are a powerful symbol, so you will want your sword tattoo design to be unique and done well.